← Challenges and the Future of Africa – What insights for Europe? Every so often I’ll be talking with people regarding the special brand of Euroscepticism that prevails in the UK and think to myself I don’t really have a serious case study in mind. 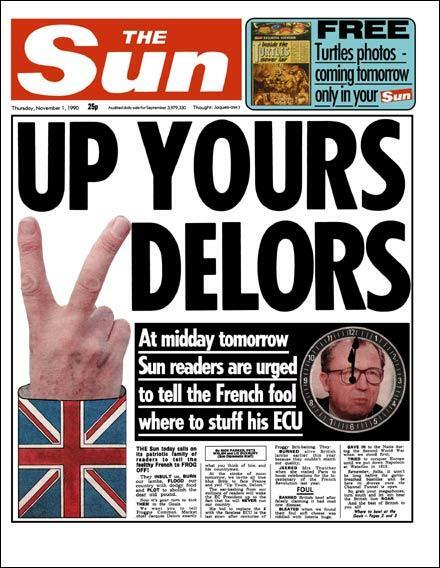 Sure, there’s the Daily Express’ “Get us out of the EU editorial” line or the famous front page of The Sun on November 1st 1990 telling the EU they could shove it in that very special “hundred year war” give-it-to-the French gesture you can’t really understand unless you have lived in the British Isles. There is also the case of David Cameron’s outrage at the the European Court of Human Rights over the Abu Qatada, which really pales in comparison to Theresa May’s visceral aversion to the ECHR, to the point of bringing poor household pets into the discussion. Clearly the politics of the issue are such that truth is not sufficient to trump prejudice, leaving someone like Ken Clarke sidelined for ridiculing such views. Long gone are the days where Blair’s main complaint was to do with how dull EU summits were. UK politicians, perhaps because they are used to command in their FPTP electoral system, often have an unhealthy isolationist relationship with the EU and international partners, that leads the them to being frustrated with and frustrating to international partners (think of this, this, this and this examples). But all these are fairly silly and uninformed discussions. This week however, I’ve come across an interesting example of a relatively well-informed person making an hyperbolic albeit informed argument that on a political level makes sense but on an institutional sense does not. Every year, UK newspapers spend a couple of weeks in outrage about the EU budget (here are some examples of outrage from 2013, 2012, 2011, 2010). This is an issue that dates back to the UK budget rebates won by Margaret Thatcher in 1984. The UK does not like to have to give money to the EU. No one likes to pay taxes, but I would agree that, within reason, it is “the price we pay for civilization”, as US Supreme Court Justice Oliver Wendell Holmes Jr. put it. This is particularly true in Europe and the barbarity of violence visited upon it during the 20th century. Therefore, this is particularly true of contributions to a joint EU budget, an institution which is the guarantor of peace in the continent. Because it is that time of the year again, the issue has popped back up on the radar and everyone is losing their mind posturing due to a recalculation of the UK’s contribution. The UK economy has done better, HMRC has more cash, so the UK’s contribution to the EU budget, a result of its own domestic revenues has been revised upwards. Cameron is outraged and surprised. The European Commission is surprised by Cameron’s surprise. Cameron is ready to unleash the dogs of war and threatens he will not pay the extra cash. The EU Commissioner warns that the same data is used to calculate the UK rebate and that it puts it at risk, not to mention that delayed payment would bring about the imposition of fines. It’s a mud fight that makes the government and HMRC look incompetent for missing a deadline to present objections over the issue. Because I’ve been busy with other things, I completely missed this until I picked up Wednesday’s copy of City AM, where Paul Ormerod of Volterra Partners, among other things, argued the timing of the EU could not be worst. I have to admit that I like Citi AM. Although I might not always agree with its libertarian editorial line, they do tend to be consistent and more importantly they do tend to welcome opposing voices and showcase both arguments to an argument, even if only on their comment section. For example, right before Mr Ormerod’s article is a very pro-EU comment by Michel Barnier, on an issue that is only tangentially related with Mr Ormerod’s argument (they both talk about the economy). might not always agree with his comments but he is on the educated end of the Eurosceptic spectrum, so I bother to read his comment. He seems to be a capitalist libertarian, and while I disagree with the merits of this philosophy, he at least appears internally consistent, as far as my superficial reading of previous comments. If you are interested in the less enlightened or altogether not argued case against this revision, here’s the Daily Express contribution for contrast. First, this is not the way you make the UK love the EU. To quote him, “It’s a pure gift to anti-EU political parties”. Second, he says that this is tantamount to punishing the UK’s success. He argues that the fact that Cyprus and Greece also have to pay more is another example of Brussels “twisted view of the world”. Third, and as a follow up from this argument that the increased payment is a punishment for capitalist success, he goes on to argue that this is the reason why EU countries have not grown as much as the USA did in the 20 years prior to the financial crisis, as concluded in a 2008 article by Bart van Ark in the Journal of Economic Perspectives. I completely agree that this is not the way to win over Eurosceptics. However, it is also not something devised to do that. That is like saying that a rise in tax revenues during boom years doesn’t increase support from anarchists, anarcho-capitalists or libertarians. It’s pretty much irrelevant. For one, these are groups who are not likely to be sensitive to changing their view. Moreover, the issue might actually lie with the way the EU funds itself, not directly by levying its own taxes but by getting countries to contribute a percentage of their revenues, proportional to their economic performance. The richer pay more, but not directly. They do so through the intermediary of their national governments. In principle the rules are agreed ex-ante so there’s no need to discuss anything more, the whole thing should be automatic, but because it goes through the national governments discussions like this happen. How much do you want to bet that of the growth in revenues that were unexpectedly high, a large chunk came from London. Are Londoners demanding to only pay the amount forecasted? Finally, I’m not sure that the EU is necessarily to blame for the EU’s lesser growth performance in the 1990s and 2000s, although issue is correctly identified. The EU did grow less fast that the USA in that period. However the why is less clear… Clearly the USA benefitted from abnormal growth due to financial and real estate bubbles that blew up in its face. Such was the shock that the Federal Reserve is still cushioning that market with QE (although at a decreasing rate). The causes of less EU innovation and growth are difficult to identify. You can find several articles from VoxEU discussing innovation in the EU here, here, here , here, here and here. It is likely that inequality of human capital at the top and knowledge superstars matter at least as much as inequality of resources and capitalists. It’s a complicated issue that cannot be summarised here. I have stuck my neck out and argued that it probably has something to do with positive spillovers from US Department of Defence R&D expenditure into the private sector, but I have no concrete definitive proof of this. R&D expenditure is quite diverse across the continent. Scandinavia does a decent job, other regions less so. Alesina and Giavazzi have argued more technically that this may have something to do with productivity and different labour-leisure preferences on the two sides of the Atlantic. What it most definitely is not is a conspiracy from Brussels. The European Commission had too limited fiscal powers during the period to have any impact on the issue. A leftwing argument might say that the budget controls imposed since the crisis will impose such austerity that this will actually come to pass, but this requires such controls to be credible (which traditionally they have not been) and the reader to believe that small countries can borrow their way out of a recession, neither of which is evident either. I’ve covered the issue of Euroscepticism in the UK on several other occasions, previously (here, here, here, here, here and here). It’s one of those really silly and misguided discussions. Clearly, the EU, as any other polity may need revising of both its institutions and policies. I do think the CAP is pretty bad. I also think we need more money to go into R&D. Institutionally, I think the EU should have more redistributive powers to manage the negative spillovers caused by asymmetric shocks within the currency union. I also think that the EU ought to have its own army, if for no other reason than to minimise the waste that permeates all national military budgets. The fact that these policies are not in place does not cause me to want to exit the EU. That attitude is a little bit extremist and immature if you ask me… But this is actually a problem. The ignorance with which the issue is discussed on this side of the Manche makes it easy to dismiss as an irritant expression of childish stupidity. But it is a serious issue. The opinion is expressed by important people in power. More importantly, it speaks to real concerns in society which no one is addressing. It’s the typical policy issue where politicians prefer to follow public opinion rather than lead the debate. Arguably, this may allow the business interests of powerful media figures to take a front seat position in the public discussion of the issue, although I wonder whether regulatory oversight is the main issue. Theoretically, it is more likely that the difficulty to capture oversight in Europe vis-a-vis the potential ease with which it can be captured at the British national level that is problematic, not just in that industry but perhaps in other industries as well. This is not a problem of “the people”, but of self interested elites with the agency to pursue a clear agenda but lacking access to or influence with a specific level of decision making. Sure, it might appear like nothing will come of it but I actually think that if the UK was to vote on the issue now, it would vote to exit, which would not be a nice thing to watch. It would probably be worst for the UK than for the rest of the Union, but it would still be unpleasant. And to the aforementioned elites the political-identity mismatch is ripe for a anti-EU narrative and the adoption of anti-European norms. So we should care and people in power should do a better job at discussing the issues at least at the same level as I did just now. It’s really not that difficult. It took me one hour to come up with this blog post. Surely, a politician with an army of advisers could do better in less time, no? This entry was posted in European Integration, European Interdependences, European National Politics, Uncategorized, Visions of the Political Future of Europe and tagged Alienating EU partners, Capitalism, Capture, CIti AM, David Cameron, EU Budget, Euroscepticism, Growth, Identity, Kenneth Clarke, Leading from the rear, Media, Narratives, Norms, Paul Ormerod, Progressive Taxation, State Revenues, Theresa May, UK. Bookmark the permalink.